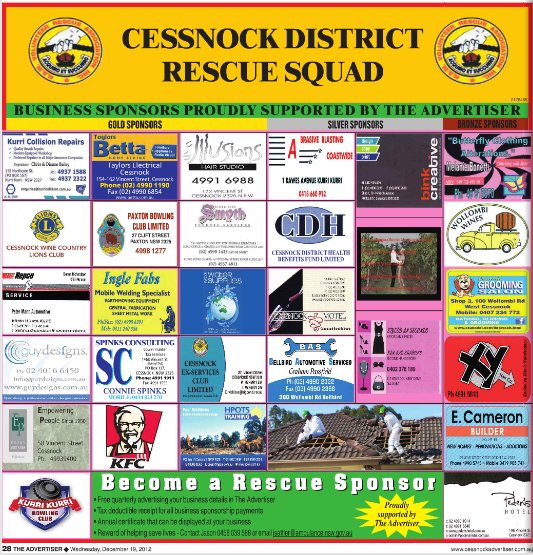 The Cessnock District Rescue Squad is sending out a challenge to all local businesses to become Business Sponsors and support your local Volunteer Rescue Squad. The Cessnock District Rescue Squad is among the best equipped rescue units in the state, however to maintain this high standard considerable and constant funding is required. The squad is a voluntary unit and the vast majority of funds are raised by the members through various fundraising activities. All squad members are highly trained State Rescue Board accredited Rescue Operators, however they are also volunteers and receive no payment for their service. Apart from responding to call outs 24 hours a day, 7 days a week they also spend hundreds of hours away from their families fundraising. People join the squad to help others in their time of need and give very freely of their time, day and night to do so. However when coupled with the required fundraising hours, which are almost always on weekends, it often becomes to much to manage and as a result they leave the squad. This has a direct and undesirable impact on the community as it affects the recruitment and retention of members. Your support as a Business Sponsor alleviates the required fundraising commitment and assists with recruiting new members and retaining skilled and experienced Rescue Operators. There are several options available within the Business Sponsorship scheme and no contractual time period, you may change or cancel your sponsorship at any time.